ICCP President Itamar Gero hands over the donation check to IsraAID’s Netanel Nisan. ICCP fully supports IsraAID’s rehabilitation operations in Tacloban for Typhoon Yolanda victims. The Israel Chamber of Commerce of the Philippines (ICCP) donated a humble amount to IsraAID to support the international humanitarian aid agency’s efforts in helping the victims of Typhoon Yolanda, which devastated the Visayas region in 2013. Typhoon Yolanda (internationally known as Typhoon Haiyan), which is the most powerful typhoon to make a landfall in recorded history, hit the Philippines on November 8, 2013. Its aftermath clearly showed that it was far worse than most typhoons which reach the country. Out of the 16 million Filipinos badly affected by Yolanda, 4 million lost their homes and 6,000 lost their lives. IsraAID was quick to respond to the crisis, sending a medical team to Tacloban, Leyte four days after the typhoon. Since then, the agency has moved on from the distribution of food and relief supplies in the area to psycho-social training and the rebuilding of medical and educational facilities. The ICCP wholeheartedly recognizes the tireless efforts of IsraAID in rehabilitating Tacloban. The organization’s donation will help IsraAID continue improving the lives of Yolanda victims. 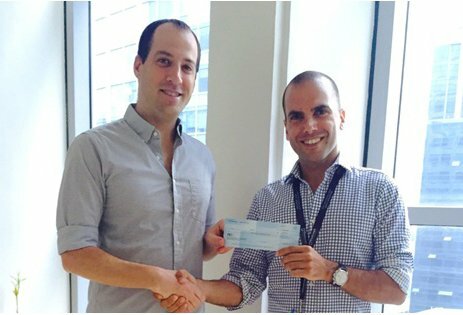 On behalf of the organization, ICCP president Itamar Gero turned over the check to Netanel Nisan, IsraAID’s Country Director. The ICCP fully supports the programs conducted by IsraAID to rekindle the spirit of unfortunate Filipinos whose lives were forever changed by the calamity. It also hopes for IsraAID’s continued progress and excellent representation of Israel in the Philippines..